We provide day care services and leisure time activities for disabled adults in Northamptonshire. We meet weekly to participate in activities, have fun and meet other people in a safe environment. We are a self help support group run by members and supported by carers. 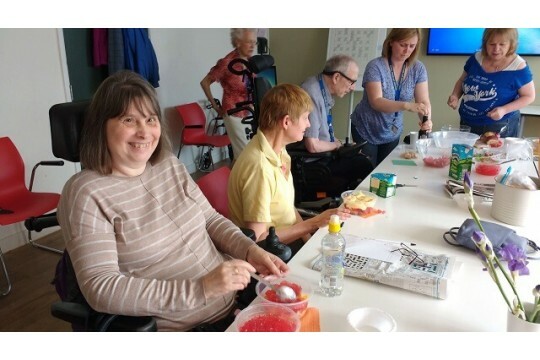 The activities we provide range from Quizzes and Bingo, Arts and Crafts and Gentle Exercise Facilities, Refreshments and Lunch. Each session is tailored around the abilities of attendees and specific calendar dates i.e. Christmas, Easter, Halloween and birthdays. Care is provided by the team to deliver individual care plans. We also help the local community by using local suppliers for various requirements; food purchases from local suppliers, we support the local community centre by meeting in the centre each week. We also purchase art and craft materials locally and occasionally we all go out for lunch to a local restaurant.